On some turtle remains from the Fort Pierre. 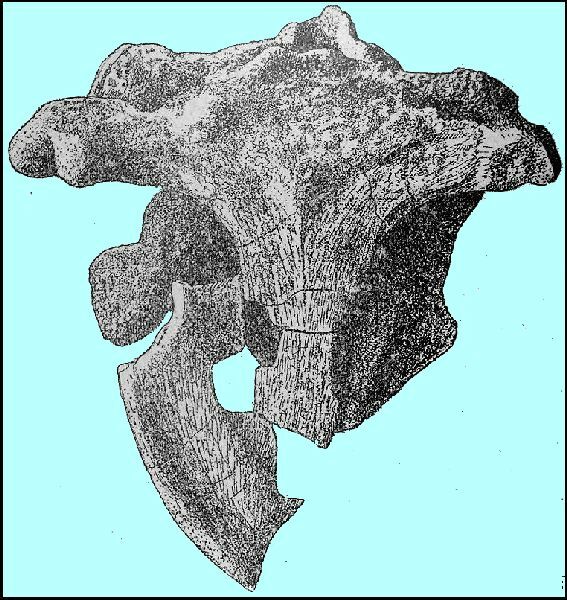 Wherein George Wagner describes several turtle specimens from the Ft. Pierre Formation (now Sharon Springs Formation) of Western Kansas. Note that the figured specimen (KUVP 1221) could not be relocated according to Schultze, et al. (1985). On Some Turtle Remains from the Ft. Pierre. Contributions from the Paleontological Laboratory, No. 37. Among the material collected this summer (1898) by the University Geological Expedition are some remains of turtles, from the Ft. Pierre. Though fragmentary, they are worthy of study; firstly, because they seem to be the first material of this nature collected from this horizon in Kansas, and almost the first from any locality; and secondly, because of their remarkable relation to the turtles described from the underlying Niobrara. On comparison of these elements with the corresponding parts of two skull of T. latiremis collected from the Niobrara, (Kans. Univ. Mus. Nos. 1214 and 1215),* I fail to find any difference in specific characters; even in size they are nearly identical. A difference in the appearance of the articular surface of the quadrate is undoubtedly due to difference in compression. This specimen was discovered by Professor Williston at Eagle Tail Creek, near Sharon Springs, Kas. *See University Geol. Survey of Kas., Vol. 4, Plate 79. (201) KAN. UNIV. QUAR. VOL. VII, NO. 4, OCT. 1898, SERIES A.
a specimen figured by Cope. 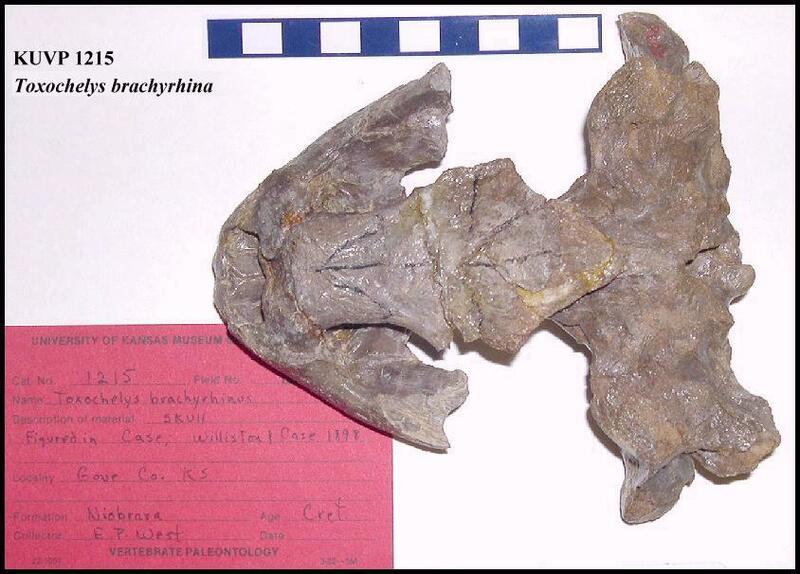 * The specimen was discovered by Mr. Sydney Prentice near Lisbon, Wallace county, Kas. *Cretaceous Vertebrates. Plate VIII. Figs. 1. la. several examples, is certainly worthy of note, and throws doubt upon the propriety of the terms Colorado and Montana in Cretaceous stratigraphy [see also Williston, 1902]. That the formation whence the specimen came is Ft. Pierre is evident from the invertebrate fauna. Prof. Williston also informs me that the genus Platecarpus, and possibly the species coryphæus, occur in the same horizon. Furthermore Prof. Case considers* Mr. Wieland's Archelon ischyros,** from the Ft. Pierre of South Dakota, congeneric, if not conspecific, with the Protostega of the Niobrara. Prof. S. W. Williston has furnished me with the above specimens, as well as with constant aid and encouragement in this and other work. To him my deepest gratitude is due. *Journal of Morphology, Vol. 14. P. 52. (1897). **Am. Jour. Sc. Vol. II, Dec., l896. P. 399, 1 Plate. Case, E. C. 1897. On the osteology and relationships of Protostega. Journal of Morphology 14(1): 21-60. Cope, E. D., 1875. The Vertebrata of the Cretaceous formations of the West. Report, U. S. Geological Survey Territories (Hayden). 2:302 p, 57 pls. Wieland, G. R. 1896. Archelon ischyros: a new gigantic cryptodire testudinate from the Fort Pierre Cretaceous of South Dakota. American Journal of Science 4 Series , 2:399-412, pl. v.
Williston, S. W. 1898. Turtles. The University Geological Survey of Kansas, Part VI. 4:349-369. pls. 73-84. Williston, S. W. 1902. On the hind limb of Protostega. American Journal of Science, Series 4, 13(76):276-278, 1 fig.